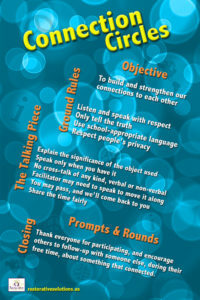 Beautiful color poster of the Connection Circle process for the classroom. Contact us to order. The “Making Things Right” DVD is a compelling overview of how restorative justice is working to successfully transform school discipline and create caring school cultures. 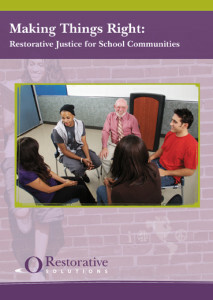 Many school communities are beginning to implement Restorative Justice into their own disciplinary process as a means of reducing suspension, expulsion, and police involvement. 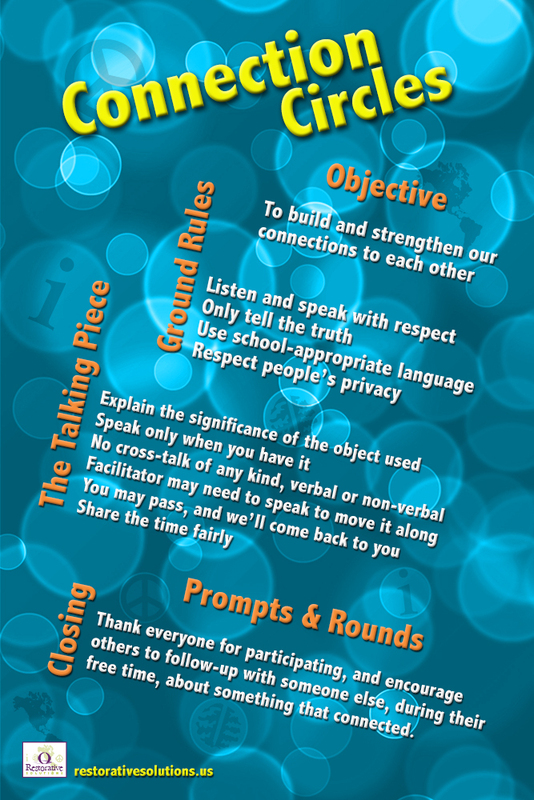 The goal of these school-based Restorative Justice efforts is to hold offending students accountable for their actions, while at the same time addressing the fears and concerns of victims and the wider school community. This video includes interviews with teachers, administrators, parents, and students who have all been impacted by the process. Kids Working It Out offers educators and parents a guide to the most current and effective school-based conflict resolution programs and shows how these programs can make a positive difference in our schools. Throughout the book, students and teachers share their stories of what it’s really like in today’s schools and reveal how Conflict Resolution Education, has shaped their experiences. Kids Working It Out covers a wide range of topics— curriculum integration, peer mediation, restorative justice, and others— and shows what it takes to implement an effective program in any school, and any community. 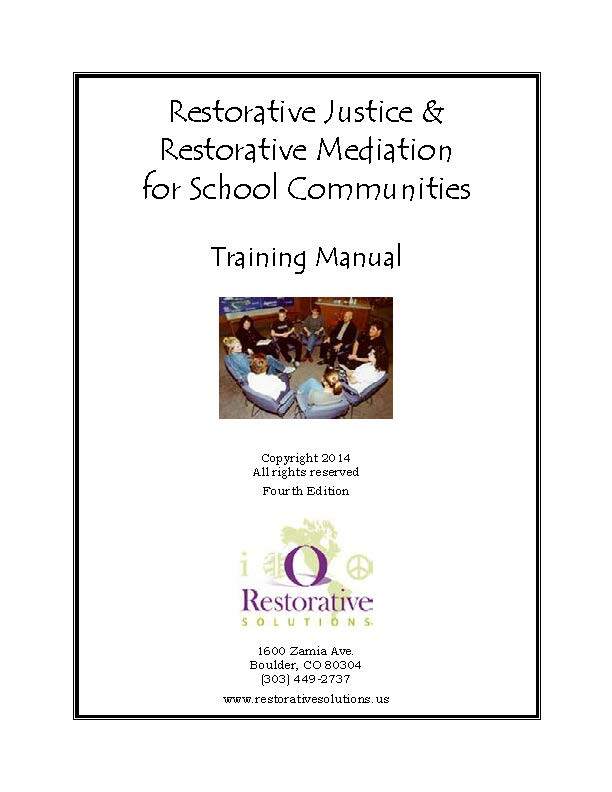 Colorado School Mediation Project/Restorative Solutions Inc.
Law Related Education and Restorative Justice is a six lesson curriculum for teachers that introduces students to some basic law-related education concepts and applies them to real world issues. 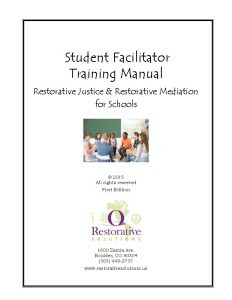 This curriculum also serves to introduce students to the rapidly growing practice of restorative justice and shows how it can compliment traditional notions of legal justice. 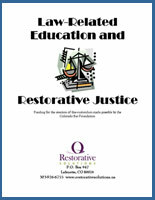 This curriculum is not intended to be an exhaustive examination of either law-related education concepts or restorative justice, but is rather a sampling of these concepts for classrooms that have limited time to work with. 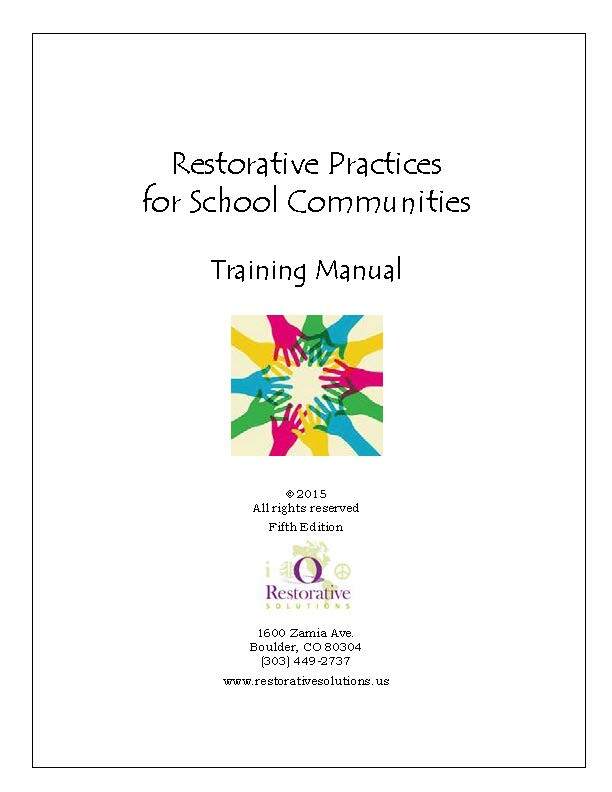 Restorative Practices for School Communities Training Manual is for teachers, counselors, administrators and other school staff that introduces them to the core concepts of restorative practices in schools. 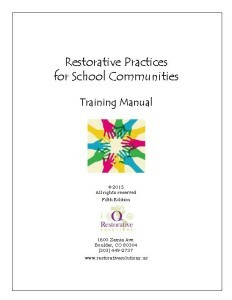 The training manual includes sections on Restorative Justice and Restorative Discipline; Restorative Theory in Schools; 5 Key Restorative Practices; Implementing Restorative Practices and Action Planning Worksheets. This training manual is intended to be used with our two or three day training. 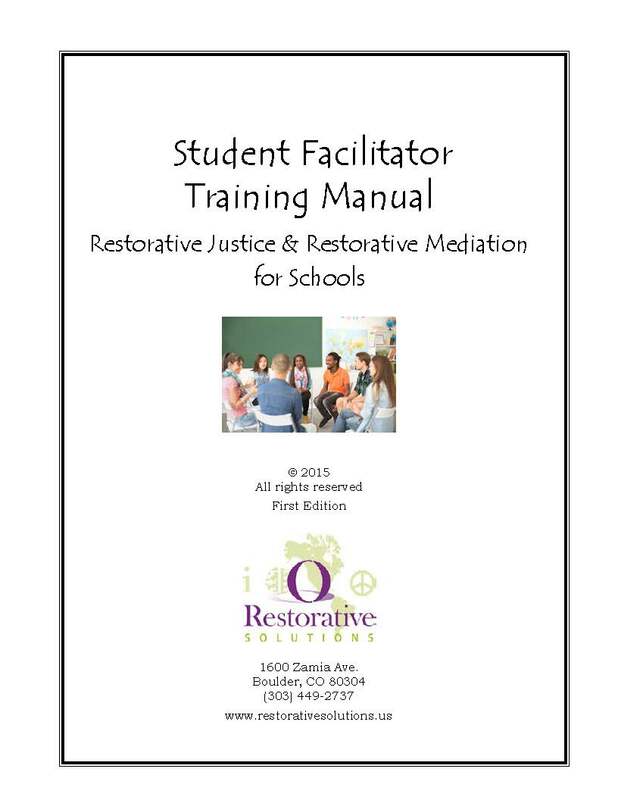 Restorative Justice & Restorative Mediation for School Communities Facilitator Training Manual is for teachers, counselors, administrators and other school staff who want to become restorative justice and mediation facilitators in their schools. 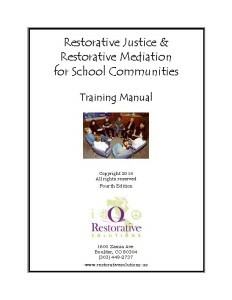 The training manual includes sections on Restorative Justice Overview; Restorative Justice and Conflict Mediation in Schools; Mediation/Conferencing; Follow Up; Implementation; and Restorative Discipline. This training manual is intended to be used with our two or three day training. 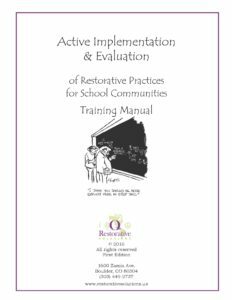 Active Implementation & Evaluation Training Manual is for teachers, counselors, administrators and other school staff who are part of their implementation team in their schools. 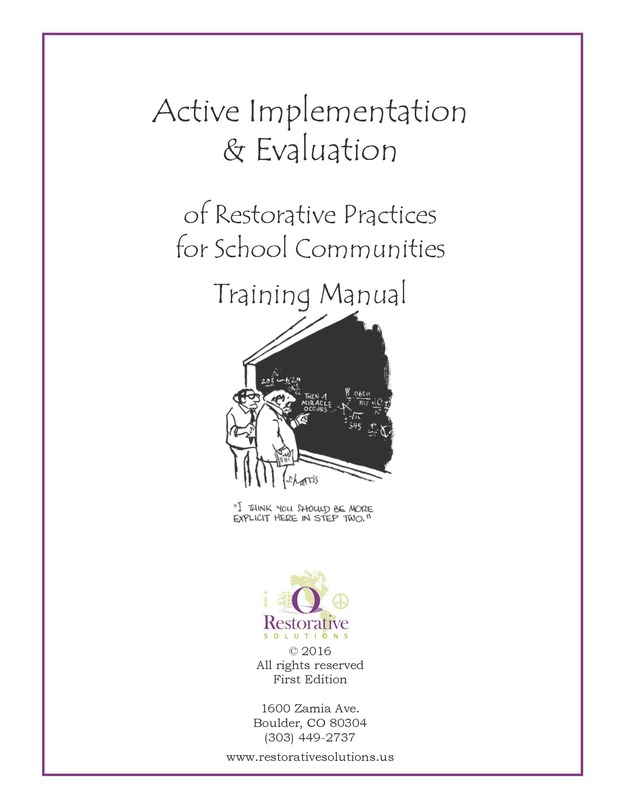 The training manual includes sections on Implementation Science; Restorative Discipline Codes; Data Collection and Evaluation; and Action Planning. This training manual is intended to be used with our three day training.